When Should I Call the Doctor About Spinal Stenosis? Are There Home Remedies for Spinal Stenosis? What Is the Medical Treatment Spinal Stenosis? What Medications Treat Spinal Stenosis? Is Surgery Effective for Spinal Stenosis? What Is the Follow-up Spinal Stenosis? What Is the Prevention for Spinal Stenosis? What Is the Prognosis for Spinal Stenosis? The spinal canal is formed by the central openings of a series of bones (vertebrae) stacked on top of each other. The upper part of the spinal canal is the cervical spine in the neck, the middle part is the thoracic spine of the midback, and the lower part is the lumbar spine of the lower back. The spinal canal is attached to the head at the top and to the pelvis at the bottom. The spinal cord passes from the brain through the spinal canal and travels down the back. Nerves exit off the spinal cord between vertebrae of the neck and low back that help control the arms and legs respectively. Spinal stenosis is a condition whereby there is abnormal narrowing in the spinal canal. This narrowing limits the amount of space available for the spinal cord and nerves. As spinal stenosis becomes more severe there is compression or squeezing of the spinal cord and its nerves. Spinal stenosis can occur anywhere in the spinal canal, but it is most common in the cervical and lumbar spine. The most common reason to develop spinal stenosis is degenerative arthritis, or bony and soft tissue changes that result from ageing. Spinal stenosis is usually seen in patients over 50 years of age, and becomes progressively more severe with increased age. The normal "wear and tear" of ageing can cause arthritis in the spine that leads to spinal stenosis. This can be from bone spurs (osteophytes) forming, bulging and wear of the intervertebral discs, and thickening of the ligaments between the vertebrae. Sometimes, increased motion between the vertebrae can cause one vertebra to slip forward on another. This is called spondylolisthesis, and it can also cause spinal stenosis. Not everyone develops spinal stenosis as they become older. Certain people are more likely to develop spinal stenosis than others. People that have a family history of spinal stenosis or other back problems are at an increased risk of developing spinal stenosis because of a genetic trait. Also, people that subject their backs to greater demands such as heavy laborers or athletes are also at an increased risk to develop spinal stenosis than someone with a more sedentary job. Spinal stenosis may also occur in people with certain connective tissue diseases such as anhylosing spondylitis. loss of control of the bowel and/or bladder. weakness along the path of the nerve being compressed. weakness or cramping in the arms and hands. weakness or cramping in the legs and feet, particularly progressively with walking and being relieved with resting. These symptoms are sometimes referred to as pseudoclaudication (false blockage) as they mimic the symptoms of inadequate circulation to the legs that is referred to as claudication. If an individual begins to experience increasing pain in the neck or back or numbness and tingling in the arms and legs you they have spinal stenosis. While these symptoms range in severity from annoying to significantly impairing function, they should be evaluated by a healthcare professional. There are many potential causes of these symptoms and some causes are serious. If the patient's symptoms last longer than six weeks or if the patient develops any increasing weakness in the arms or problems controlling the bowel or bladder they should seek medical attention. When the patient visits a doctor, he or she will be asked questions about his or her symptoms. This is called a medical history. It will allow the doctor to obtain information about when the patient first developed symptoms, what makes it better or worse, what previous treatments have been tried, and what other medical conditions the patient may have that can affect spinal stenosis. The doctor will then perform a physical examination, which will test the patient's muscle strength, reflexes, sensation, balance, and circulation to help determine if he or she has spinal stenosis. The specific location of the patient's symptoms can help the doctor determine which nerves are affected by the stenosis. After the medical history and physical examination the doctor may order various tests to help confirm the diagnosis of spinal stenosis. These can include imaging studies such as X-rays, a CT (computerized axial tomography) scan, or an MRI (magnetic resonance imaging). These can help identify if the patient has any arthritis in the spine and can show the spinal cord and nerve being compressed. The doctor may also order testing of the patient's nerves to see if there is any damage to the nerves caused by the spinal stenosis. These tests are called nerve conduction studies and EMGs (electromyography). There are various treatments available for spinal stenosis depending on how severe the patient's symptoms are and underlying medical conditions. In the majority of cases, it can be treated without surgery. If the patient's symptoms are relatively mild and resolving he or she may not need to seek medical care. In many cases symptoms can improve with simple measures the patient can begin on their own. Activity modification can help lessen symptoms. The patient should try to avoid certain activities that tend to worsen the symptoms. Heat or ice to the affected areas if needed. Over-the-counter medications may be taken to relieve pain. There are a variety of medical treatments available for spinal stenosis. Initial treatments include anti-inflammatory medications such as ibuprofen (Motrin, Advil, etc.) or naproxen (Anaprox, Naprelan, Naprosyn, Aleve). These medications help reduce the inflammation and swelling around the nerves being compression. Oral cortisone medications may be tried. Epidural steroid (cortisone) injections can provide a larger dose of medications to reduce inflammation directly to the site of nerve compression. Physical therapy can help strengthen the muscles surrounding the spinal column and take some of the pressure off the spine. Sometimes, patients do not obtain enough relief of their symptoms from these nonsurgical treatments. If the patient is unable to function or do his or her normal activities due to pain, surgery could be an option. Additionally, patients with severe spinal cord compression (myelopathy) or increasing weakness of the muscles should consider surgery to help prevent permanent nerve damage. The surgeon customizes the surgical options for each person. There are several types of surgeries to treat spinal stenosis. The goal of each of these surgeries is to provide more space for the spinal cord or nerves that are being compressed due to spinal stenosis. This is accomplished by various procedures that involve removal of bone and/or tissues that are compressing the spinal nerves in the low back, referred to as decompression. These operations all require diligent management of postoperative care. Surgical procedures for spinal stenosis in the spine of the low back that are somewhat less invasive than traditional lumbar decompression have become available. Interspinous devices that have been used in certain patients for this purpose include X-Stop and Coflex devices, but these are considered investigational devices by many practitioners at this time. In the lumbar spine, this is most commonly treated with a laminectomy. This surgery removes a portion of the vertebra (lamina) to create additional space for the nerve. If any a small portion of the lamina is removed it is called a laminotomy. If too much of the bone has to be removed, or if there is too much motion remaining between the bones, the decompression may need to be combined with a fusion to help stabilize the spine. In the cervical spine, the most common treatment is an anterior cervical discectomy and fusion (ACDF). With this surgery the disc is removed from between two vertebrae along with any bone spurs pushing on the nerves or spinal cord. A bone graft is then used to replace the disc, and a metal plate is attached to the front of the vertebrae to help the bone grow together or fuse. If multiple levels are involved in the neck, one of more vertebrae can be removed. This is called a corpectomy. After the bones are removed, a bone graft replaces them along with a plate. Cervical spinal stenosis can also be treated surgically from the back side of the neck. A laminectomy can be performed as in the lumbar spine, but is typically combined with a fusion in the cervical spine to prevent any abnormal motion from instability after the surgery. A final procedure for cervical stenosis is a laminoplasty. The involves creating more space in the back of the spinal canal by opening the back of the spine like a door, and leaving it open with a combination of bone grafts or plates. The follow-up care with a physician will depend on what treatment has been provided. If the patient is treated without surgery he or she will likely have close follow-up initially to determine how he or she is are responding to the treatment. Once the symptoms begin to improve the patient can follow-up less frequently or only if he or she has a problem to discuss. If the patient has had surgery he or she will have close follow-up for years after surgery. Unfortunately, there is no way to prevent spinal stenosis from occurring. It is most commonly due to degenerative arthritis that occurs with ageing. Individuals can help limit the symptoms by staying fit and in good overall shape. In most cases the prognosis for spinal stenosis is very good. Many people can obtain good relief of their symptoms with nonsurgical treatment. In some case, as the stenosis becomes more severe, the nonsurgical treatment become less effective. For those patients, surgery is a good option to consider. Most patients obtain good relief of the symptoms in their arms and legs soon after the surgery relieves the compression of the nerves. The exception is in more severe cases where there was prolonged compression of the nerves that caused permanent nerve damage. As in other parts of the body, arthritis of the spine can be progressive even after surgery. It is possible to develop new symptoms years after surgery either at the same level or at nearby levels. Osteoarthritis (OA) is not a single disease but rather the end result of a variety of disorders leading to the structural or functional failure of one or more of your joints. Osteoarthritis is the most common cause of chronic joint pain, affecting over 25 million Americans. Osteoarthritis involves the entire joint, including the nearby muscles, underlying bone, ligaments, joint lining (synovium), and the joint cover (capsule). Osteoarthritis also involves progressive loss of cartilage. The cartilage tries to repair itself, the bone remodels, the underlying (subchondral) bone hardens, and bone cysts form. This process has several phases. Levin, Kerry, MD. 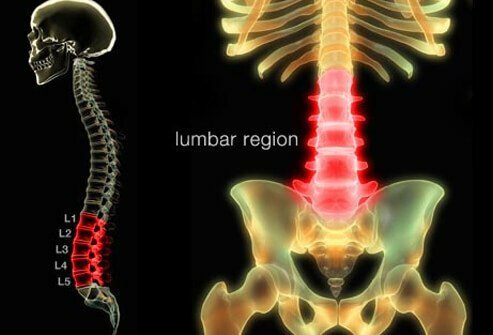 "Lumbar spinal stenosis: Treatment and prognosis." UpToDate. Updated Oct 15, 2014. Please describe your experience with lumbar spinal stenosis. What was the treatment for your lumbar spinal stenosis?